Superman, also known as The Man of Steel, Man of Tomorrow, the Metropolis Marvel and Last Son of Krypton is a comic book superhero (fictional character) created by writer Jerry Siegel and artist Joe Shuster. The Superman character appears in publications by DC Comics (the first appearance was in the comic book called Action Comics #1 in June 1938). On this page you will find Superman Games to play online for free. Choose the superman game that you want to play from the list above. You can also find Superman games for kids to play and have fun. BOOKMARK THIS PAGE NOW so you can easily find our site next time you want to play supermangames online. Superman is the first comic hero of DC Comics; he appeared in the first number of these comic books, dating back in 1938. Widely regarded as an American cultural icon, Superman is a Kryptonian descendant. His father rockets him to Earth, before the destruction of planet Krypton. On Earth, he is adopted by a farmer from Kansas and raised as Clark Kent. In what concerns Superman’s name, his creators, Jerry Siegel and John Shuster, stated: “Jerry created all the names. We were great movie fans, and were inspired a lot by the actors and actresses we saw. As for Clark Kent, he combined the names of Clark Gable and Kent Taylor. And Metropolis, the city in which Superman operated, came from the Fritz Lang movie [Metropolis, 1927], which we both loved”. This is the hero of Superman games. Superman became an American cultural icon. The phrase “I am not Superman” or “you are not Superman” is a commonly used idiom that expresses somebody’s lack of omnipotence. Superman games haven’t always been well received by critics. They had much to argue about their quality. Despite this, Superman free games are among the most popular games. They first appeared in 1979. With the development of computers and the Internet, Superman games online started to become more and more popular for kids, along with the increase of the super-hero’s popularity. The first Superman game had the next plot: the player takes control of Superman, who must repair the bridge destroyed by Lex Luthor, capture Luthor and his henchmen, enter a phone booth to turn back into Clark Kent, then return to the Daily Planet in the shortest amount of time. To slow Superman's progress, Kryptonite has been released by Luthor. 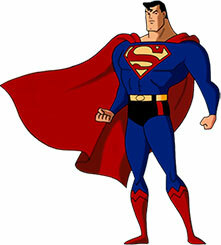 If he is hit by Kryptonite, Superman loses his abilities to capture criminals and fly. To regain them, he must find and kiss Lois Lane. The first version of a Superman game was for Atari 2600. Other versions, that can be now purchased, are for Nintendo DS, PlayStation 2, Xbox 360, Xbox, PlayStation Portable. One of the most important Superman game is Superman returns game. Loosely based on the Superman movie of the same name, it features the voice and likeness of many cast members. In the game, Superman combats Metallo, who does not appear in the movie, as well as other classic villains. The game was released on Xbox 360, PlayStation 2 and Xbox. The Nintendo DS also featured games based on the film, but they are fundamentally different from the console titles. The games Superman have also had some cancellations, a sign which states the fact that the creators of the games are concerned about keeping their standards high. Furthermore, there are a number of 7 games that feature Superman. Also, on the Internet, there are free Superman online games, for each and every person who wants to play them. Online Superman game has interesting concepts (their plots attract the interest of the players), although some may argue their quality. Superman games for kids have a hero that undergoes a series of changes, mainly due to the USA’s social and economical background. These changes reflected in the traits of Superman. Superman kids games depict villains in a unique way; Kryptonite, Brainiac and Bizarro have become synonymous in popular speech with Achilles' heel. They have extreme intelligence and reversed logic. Superman’s success on the market made it possible for the creation of many other super-heroes, such as Batman or Spiderman, Wonder Woman or Iron Man. We somehow live in a world that feels not the simple need, but craves of being protected by super heroes. Thus, this industry will always be successful and these games, among which we can enumerate Superman games, will be famous throughout time.